"Connecting People, Programs & Parks"
Dykeman Park plays to a par 70, at 6185 yards using the longest tees. 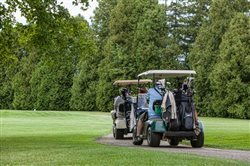 When using the shortest tees, it plays to a par 73 measuring 5347 yards.Dykeman Park’s two sets of nine holes vary in terrain, the front being a relatively flat par 34 and the original back nine consisting of rolling hills and plays to a par 36. All eighteen holes are lined with beautiful mature trees and include a number of challenging dog-legs. Men, women, and juniors may play either using a golf cart or walk with a pull cart. Click here to see our calendar.